Nadia Crighton takes a look at some steps to how to teach your dog to swim this summer. Some of our dogs are graceful Olympic swimmers, with highly efficient tails that work as remarkable rudders. In fact, the swimming abilities of some dogs showcased on YouTube suggest that a majority are much better swimmers than their human owners! However, for a small handful of pooches, taking to the water is a lot more stressful than one may consider. So how can we ensure our dogs are safe in the water, regardless of their abilities, and what if they are fearful? Here are some pointers to teach your dog how to swim. Get your new puppy slowly used to the water. This is the time when ‘positive’ experiences are vital in the future of your new friend. If they experience a ‘negative’ experience with water, this could stick well into adulthood and your dog may never learn to enjoy the pleasures of a swim. It’s also best to consider introducing your pup to water after the 8-12 week fear period, just to be safe. Encourage your pup to dig and lick the water. Small splashes. Think about using a good array of treats or their favourite toy. This can be done at home in a clamshell or kids paddling pool before venturing to a calm swimming spot. Also think about warming the water slightly so your pup doesn’t get cold. To teach your dog how to swim begin with calm water and not the ocean. Stand a few steps ahead of your dog and call your puppy/dog towards you. Encourage them to lick and play with the water. If your dog is comfortable going deeper help them by cradling their body under the water as their paws lift. Move them slowly forward and this will encourage their legs to swim. Face them back to shore and encourage them to swim back. This will help them understand that there is a ‘deep’ and ‘shallow’ end of the water. Don’t forget ample towels and treats! When boating it’s a good idea for your dog to always wear a life-jacket or dog harness regardless of their swimming experience. They come in a variety of shapes and sizes to suit all dogs. Ensure the life-jacket is tight fitting and tied correctly. During a boating accident, like with the two-legged variety, you may not have time to secure a life-vest. So always be prepared when on the water regardless of yours, and your pooches, swimming abilities. 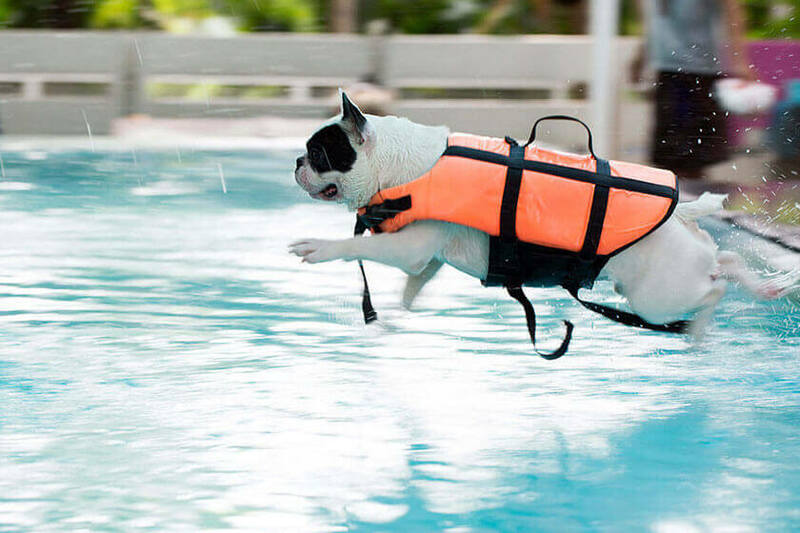 Life jackets are also handy tools in teaching your dog to swim as they have little handles on the top you can hold your dog with. Most dogs love heading to the beach on a hot day. Don’t forget to pack a drink bottle for your dog as that salt water can cause dehydration. Some dogs might be a little apprehensive about the surf, so take your time introducing your dog to this strange environment and remember to keep your own anxiety under check. Dogs respond hugely to what we are feeling. Also always check how deep the surf is, sometimes it can drop off suddenly and a dog caught in a rip that suddenly looses their footing can cause for some panic. Be safe. If it’s rough on the water throw the ball on the sand and let your dog paddle. If it’s a nice calm day, why not consider a swim yourself and throw the ball across the water not out to sea. Secure pool fences and keep dogs away from the pool. Dogs can drown in pools even if they can swim as most find it exhausting trying to get out. If you allow your dog to swim in your pool don’t forget to teach them how to get out or think about installing a ramp. Don’t throw balls into heavy surf and consider only throwing the ball across the water not out to sea. Always wear life-jackets when boating. Take extra fresh water to the beach for your dog. More on water safety found here.